Electrical “shore” power is not always available on location. When portable generators are not available, battery powered operation is often the only alternative. 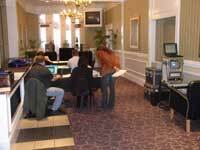 Tennessee Prompters can provide battery powered service for remote locations, with advance notification. Teleprompter service, for some, is essentially an insurance policy. Tennessee Prompters send a backup computer, free of charge, on every job, however, for those who really want to cover all the bases, the ultimate performance insurance is to have two computers, running in tandem while being controlled, in sync, by the same operator. Then, if there is an issue with the first computer, all our operator needs to do is A/B switch from the first computer to the second. This feature also works nicely for those jobs which require last minute insertions of text prior to being prompted. Tennessee Prompter’s clients often make changes to their speeches during rehearsals and desire hard copy output of their updated text. For the TAP Pharmaceutical Product’s convention, event producer Jack Morton Worldwide setup shop in a foyer at Opryland Hotel. Note our printer located on cases behind the teleprompter station on the right.